Speaking of "all things OSIRIS" I just ran across the OSIRIS optical communications system for cubesats and smallsats. 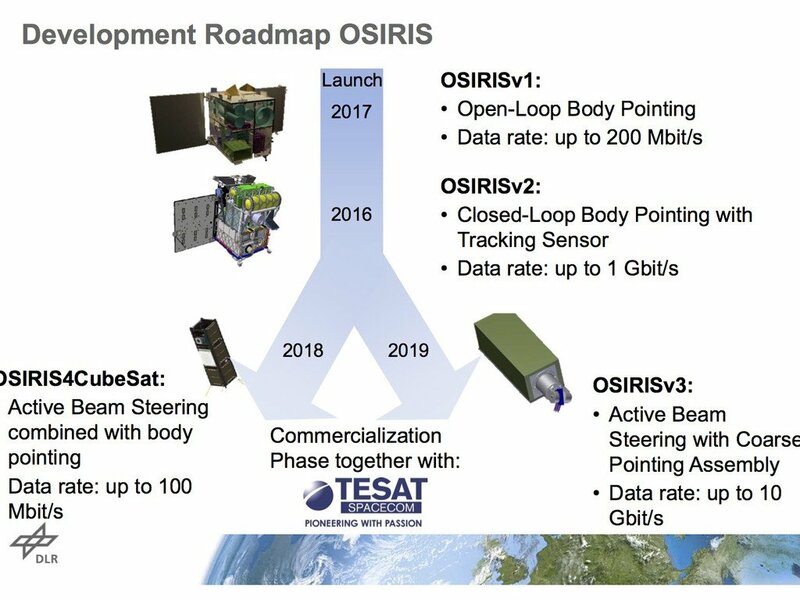 OSIRIS (Optical Space Infrared Downlink System) highly compact optical communication payloads for small spacecrafts in a LEO 1, 2, 3, 4, 5 is about ⅓U in size. I am not sure if it is meant for inter-satellite communications, or comms with Earth stations. Nor if it has been put in space and tested. Is this known? If possible, any information on how this tiny system acquires and locks on to an Earth station with such a high differential velocity would be appreciated. Does it do it's own slewing, or rely on the cubesats ADCS to maintain its pointing? The PDF I've linked to seems to be early on in the development, so things may have changed. above: CubeL (Credit: Tesat). From here. BACKNANG, Germany 12.04.2018 Tesat PR) — Tesat’s Laser Communication Terminal for CubeSats, CubeL, is on track after recently the Critical Design Review (CDR) was successfully held at the German Aerospace Center (DLR) in Oberpfaffenhofen. This was an important milestone for the development program on the way to its demonstration mission, which is planned to launch later this year. CubeL is a joint development program between the Optical Communication Systems (OCS) group of the DLR Institute of Communications and Navigation (IKN) and Tesat-Spacecom as the industrial partner. The successful work split of the product development between DLR IKN and Tesat is the key of this new space product. “It is great to see how the teams are transferring scientific cutting-edge technology into a real commercial product line”, said Philipp Biller, Product Manager at Tesat-Spacecom. 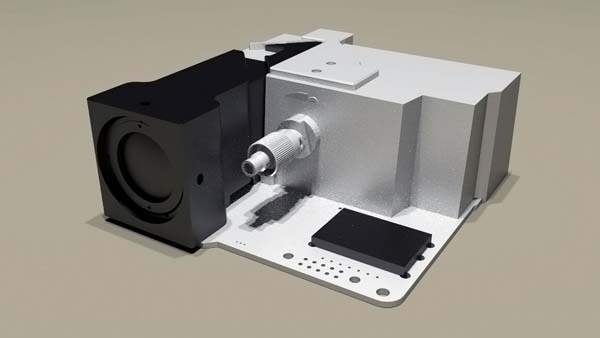 With a size of only 1x1x0.3U (~10x10x3cm³) and a mass of about 350 gram the CubeL is the smallest laser communication terminal on the market. The data rate of 100Mbit/s will help to overcome the current bottleneck of today’s downlink technologies for CubeSats by a factor of 100 compared to common UHF links and enable new big data generating applications such as hyper spectral imaging. “Introducing CubeL is a consequent expansion of Tesat’s unique laser communication product portfolio to offer both edges of the market. From high performance GEO to GEO inter-satellite terminals to ultra small low cost solutions for smaller satellite platforms”, said Matthias Motzigemba, Tesat’s Head of Sales Communication Systems. As of October 2018, the programme is in Qualification. Launch is scheduled for Q1/2019 with a Rocketlabs Electron on a Gomspace 3U platform. Optical communication is for downlinks. Not the answer you're looking for? Browse other questions tagged communication cubesat optical or ask your own question. Could “live” video be transmitted from Mars? Any relationship between Rosetta's OSIRIS camera, OSIRIS-REx, OSIRIS-3U, OSIRIS optical comms, OSIRIS spectrograph, & OSIRIS game? Why are Tiangong-1's Apogee and Perigee Graphs Wobbly? How much power loss does the LLCD suffer in transit? What's the current timeline for NASA's Mars orbiter laser communications? Laser communication for interplanetary probes - aiming is impossible without beacon? Use or tests of multimode optical fiber for cubesat battery charging or datalink while in storage, or waiting to launch?